There are a few times a year when I wish I could steal/borrow a child. Time #1…Sundays during baseball season. Kids can run the bases for free after Indian’s home games. A child would be my ticket onto that baseball field. On the same field that Omar played on … Kind of a big deal in my world. Time #2…School supply season. I have talked about this before. I get this crazy urge to buy pens, paper, pencils, crayons, bookbags, new tennis shoes, notebooks, markers. I wish adults were sent home from work with a supply list. Time #3…Christmas. Not so much for the trip to the mall to see Santa. That generally ends up being a screaming/crying/unhappy moment for most kids and parents and Santa and Elfs. Nah, not my cup of tea. 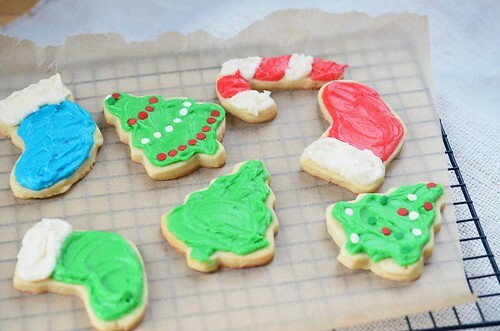 Decorating sugar cookies, now that is a Christmas activity that is way more enjoyable with little ones. It is fun without kiddos but they bring a little something extra to the sugar party. Maybe it is their creativity, their imagination, their love for anything full of sugar, their love of anything Christmas. I don’t know … it is just better. 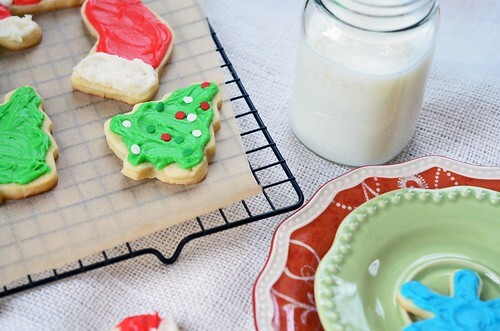 I made this batch of sugar cookies by myself, belting out Adele Christmas music, making my kitchen one sticky mess….However, it is still early and more batches can be made. So, if you have kids you want to get rid of for an afternoon, let me know – I just need 8 hours advanced notice – the dough does need to chill out. 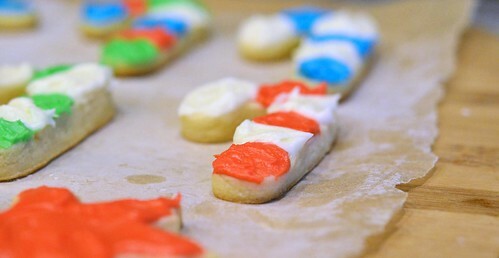 The secret ingredient in these sugar cookies is cream cheese. It adds a nice flavor, tangy but not tangy because sugar cookies shouldn’t be tangy or sour no these aren’t sour, they just taste like their is cream cheese in them. That tangy but not tangy flavor pairs well with the sugary sweet icing. 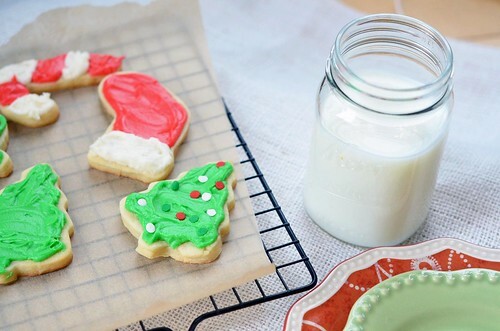 Sugar cookies are a must during this time of year. So grab your kids, clear your schedule, find the cookie cutters, preheat the oven, and go to town…You will not be sorry, plus you may just start a new tradition! In a large mixing bowl, cream together butter and cream cheese. Add sugar and continue to cream until light and fluffy. Beat in egg yolk, vanilla extract, and salt. Beat until well mixed. With mixer on low, slowly add flour and mix until flour is completely incorporated – scrape down the sides of the bowl and bottom of the bowl half way through mixing so everything gets incorporated. Cover with aluminum foil/plastic wrap and place in refrigerator for at least 8 hour or overnight. 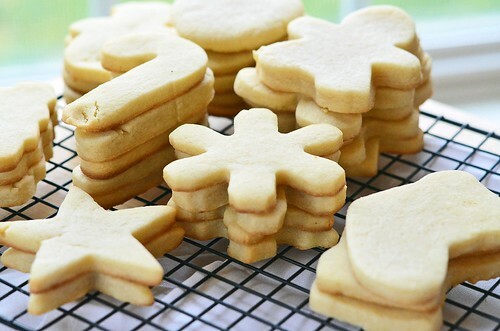 On a lightly floured surface, roll the cookie dough out to about 1/8 to 1/4 inch and with a cookie cutter, cut out shapes. Place cut outs onto ungreased/parchment paper lined cookie sheet. Bake in preheated oven for about 8 to 10 minutes, just until the bottoms begin to brown. Remove from oven and let cool on cookie sheet for about 3 to 5 minutes before transferring to wire rack. Once completly cool and if you are so inclined…lather them in icing! But only once they are completely cool. Icing recipe follows. Before placing in an airtight container, let the icing dry. In a medium bowl, cream butter. Slowly add confectioner’s sugar and beat until combined. With mixer still on low, add milk 1 tablespoon at a time and then add vanilla. Increase mixer spead and beat until desired consistency is met, the more it is whipped the more airy it will be. I find that about 3 minutes is perfect. Divide icing into bowls and add food coloring. Ice cookies.